This comment refers to the article available at https://doi.org/10.1007/s40257-018-0368-3. 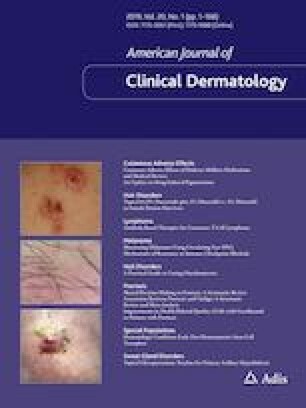 I read with interest the review of keratosis pilaris, keratitis pilaris atrophica (KPA), and associated conditions by Wang and Orlow . As a physician with two sons who have keratosis follicularis spinulosa decalvans (KFSD) due to mutation of the MBTPS2 gene (ours is a pedigree in reference 45) , I would like to point out the under-recognized ocular findings associated with KFSD. They were mentioned by Siemens , who first described KFSD. These include chronic blepharitis/meibomianitis, deficient tear film, keratitis, and photophobia. The deficient tear film with KFSD has been recognised in the TFOS DEWS II (Tear Film and Ocular Surface Society’s Dry Eye Workshop II) as a new cause of dry eye syndrome. The lipid layer in the tear film is abnormal and deficient . The MBTPS2 gene link with cholesterol homeostasis is interesting . Wang and Orlow discussed KPA pathophysiology with this same gene and the LDL receptor protein-1 . I have MBTPS2 abnormalities and a high lipoprotein(a) level with a history of non-ST-elevation myocardial infarction (NSTEMI). Is there a link with KPA disorders and both lipid disorders and tear film quality? I believe that heightened recognition of these findings in this disorder will result in more attention to the symptoms of KFSD (and KFA) and stimulate research that may have implications for the common dry eye syndrome and lipid disorders. No funding was received for the preparation of this letter. M. Cannell has no conflicts of interest to declare.